AKANEIA's "appearance" in Melee; attempting to start the match will freeze the game. AKANEIA is a stage remnant in Super Smash Bros. Melee that can only be accessed through the activation of the debug menu by Action Replay. Both evidence left in the game itself and a comment by Masahiro Sakurai confirm that the stage was intended to be a Fire Emblem stage; Fire Emblem is the only universe with playable characters which has no stage of its own in the final version of the game. The game crashes if a battle is started with AKANEIA designated as the stage via the debug menu. Unlike similar non-playable levels in Melee such as DUMMY and ICETOP, there are no known hacks which allow AKANEIA to be properly accessed, and it is the only stage in all the game that is completely inaccessible. 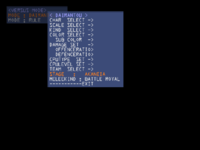 Unsubstantiated rumours claim that pieces of it can be isolated or viewed within the game's data, but no evidence proves that anyone has successfully accessed AKANEIA or discovered any unique elements for it. According to Masahiro Sakurai, responding on Smabura-Ken to a fan's confusion about the Fire Emblem series' lack of a stage, a Fire Emblem stage called アカネイア王国 ("Kingdom of Archanea") was in fact planned to appear in Melee. It was intended to feature onagers slinging boulders at a castle, while dragons and mages would make appearances in an unspecified role. Unstated circumstances regarding its production resulted in it being scrapped. The unused AKANEIA is a remnant from this plan, as well as the fact that the track "Fire Emblem" is named AKANEIA.HPS within the game's data. The idea of a Fire Emblem stage consisting of a castle under attack would be revisited in Super Smash Bros. Brawl, with the stage Castle Siege. 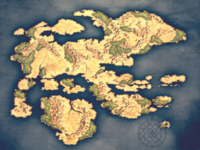 The continent of Archanea in Fire Emblem: Shadow Dragon. Archanea (known as Akaneia in Japanese and, prior to 2017, in PAL releases) is a significant location featured in the first, third, eleventh, twelfth, and thirteenth Fire Emblem games, and is the name given both to the continent the games are set on and the mightiest nation on said continent. All of these games have featured Marth - who becomes the ruler of Archanea at the end of the story - in some capacity, and the first and third games were released prior to Melee. ↑ Source Gaming: "The Definitive Unused Fighters List in Smash"
This page was last edited on January 28, 2019, at 19:44.